Hi everyone! 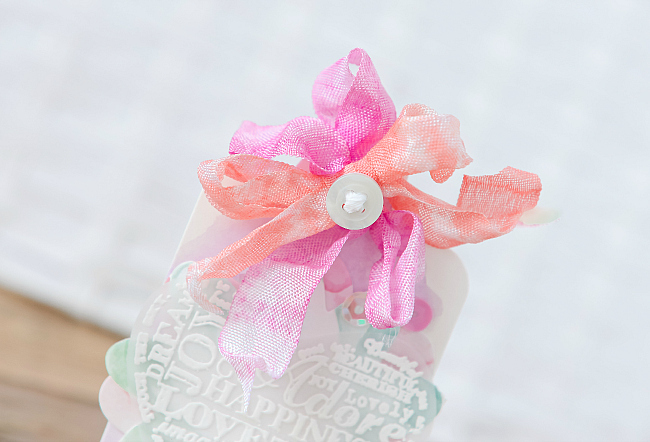 Today I'm kicking off Gift Tag Days! Join me back here to check out a new tag each day. It's been a little lonely in our gift wrapping pile, and I think these tags will brighten up our stash nicely. Today's tag is inspired by wanderlust and everything I love about Summertime...Last week, we traveled out East to Toronto and Niagara Falls. Despite the gloomy forecast, we loved all the little shops we visited and the welcome change of scenery that travelling brings about. It's what I love the most about travel - getting away from the everyday and experiencing new colors, tastes, sights, and people. So today, I'm sharing a bright little number, inspired by all the pretty things I saw, and especially the lovely Summery fabrics that I've been seeing everywhere, which remind me of endless Summer - something I've always longed for. To start, I used a little watercolored tag (I believe this was a Target find), and layered a few more pretty petals from the same pack of tags. I loved the colors in the set and I think they're right on trend with the pretty floral fabrics of the season. 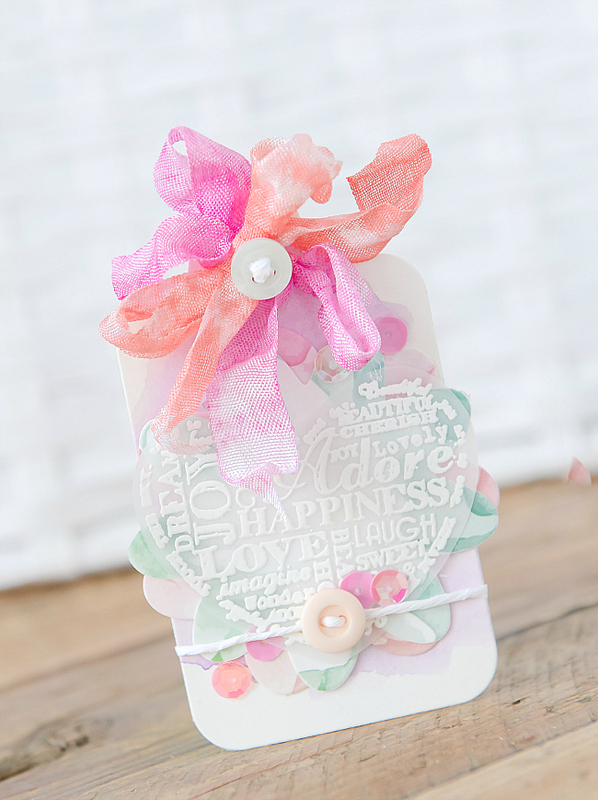 For the top of the tag, I used two vibrant shades of wrinkled ribbon, and a soft aqua button. 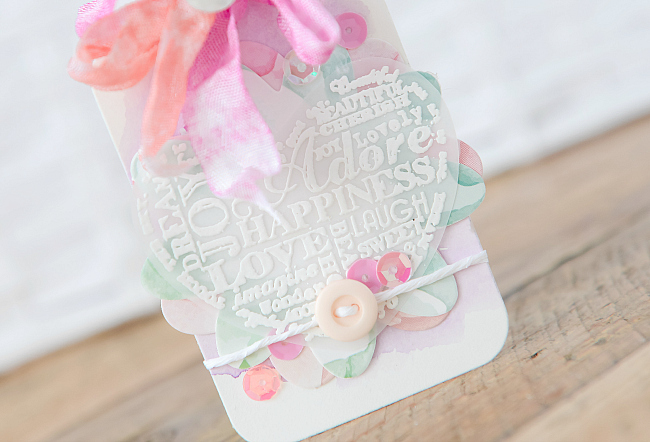 Just below, I stamped and embossed a heart full of happy words, and used my scissors to cut around the heart shape. Below that, a little bit of white twine, another teeny button and some pretty sequins! Not a lot of fancy products used on this little tag, but I adore it nonetheless. And since I couldn't bring back all the beautiful finds from our travels, this does the trick, and makes me oh-so-very-happy! Thanks for visiting, today and always, and stay tuned for three more days of colorful tags!